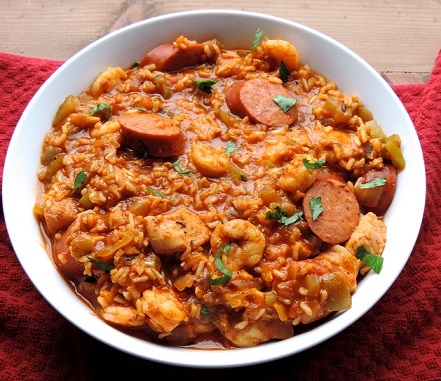 Famous Jambalaya Recipe and famous country song! When I make this Jambalaya Recipe I think and often play the country song written by Moon Mullican and Hank Williams documenting this Cajun food or Creole food, depending on the cooking method you use. The song reached # 1 on the U.S. Country Music Charts and remains one of Hank's most popular songs today. I love that song, but I also love to prepare, serve and eat this Louisiana specialty. That song actually increased the rest of the nation's interest in Cajun and Creole cooking and in this dish specifically. Just for fun, here is a wonderful "take" on the song by Hank Jr. and 4 year old Hunter Hayes. Sing it Hank and Hunter! It seems we are almost guaranteed a good time whenever we have this wonderful "clean out the ice box" kind of dish. There are probably hundreds of variations on this dish. Jambalaya may be made with beef, pork, chicken, duck, shrimp, oysters, crayfish, sausage, or any combination of those ingredients. But most every Jambalaya recipe does call for onion, celery and green peppers and every recipe I have seen has cayenne pepper and / or Cajun seasoning. And serving it with rice is "mandatory." 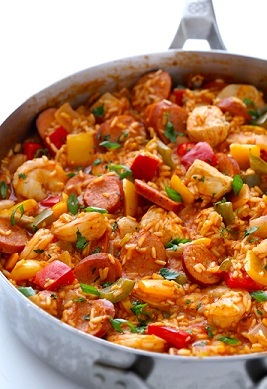 Jambalaya is traditionally a "one pot meal," and there are two main methods for making it. The first, and most common in Southeast Louisiana, is Creole Jambalaya, also called red Jambalaya because it contains tomatoes. This recipe is characteristic of the second style (Cajun) and is more what you find in the southwestern and south-central parts of Louisiana. It does not contain tomatoes. The meat is browned in a cast-iron pan or a heavy stainless steel pan and the bits of meat that stick to the bottom of the pan are what give it a brownish color. The dish is finished when the rice has cooked (which is frequently long grain white rice - a major product in the American South). Option: Finish the Jambalaya by transferring it to a baking pan and bake it uncovered in a 350 degree F oven until rice is tender but still has a little bite to it (about 1 hour). This method will assure the bottom of the pan will not burn. Remove from oven, stir well and then allow it to sit for 5 minutes before serving. Serve your delicious Jambalaya with a crisp green salad with a vinaigrette dressing and some crispy French bread. 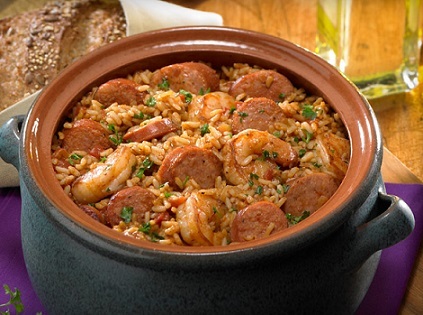 Enjoy your Jambalaya Recipe and the company of those you share it with! Did you know? Filé powder is used in Louisiana Creole cuisine in the making of some types of gumbo, a thick Creole soup or stew often served over rice. "Filé gumbo" is famously mentioned in the classic country song by Hank Williams Sr., “Jambalaya (On The Bayou)”, which reached number one on the U.S. country charts for fourteen non-consecutive weeks.